Another Moscow site - The Sobornaya Square (Cathedral Square). The Sobornaya Square (Cathedral Square). The oldest square of the Russian capital has been a symbol of Moscow for a long time. Its origin goes back to the depths of centuries. The son of Prince Daniil — Ivan Kalita (1288 — 1340) — declared Moscow the capital instead of Vladimir. Due to the new status the Kremlin was growing and changing. Three marvelous cathedrals formed the Sobornaya Square — the Cathedral of the Assumption (1327), the Archangel Cathedral (1333) and the Church of St. Ioann Lestvichnik with a bell-tower (1329). Ivan III renovated all the key buildings in the Kremlin. The Sobornaya Square was transformed according to the traditions of the Italian Renaissance. The Palace of Facets reminding of a Florence palazzo was built by Marco Fryazin and Pietro Antonio Solari invited from Milan. The principal front of the building was faced with tetrahedrons — the name "Palace of the Facets” originated from the type of facing. The Palace was meant for official receptions. An open stone staircase — the Red Steps — led to the front Holy Entrance. Standing on the stairs there tsars addressed the people, met foreign ambassadors. They walked to the Cathedral of the Assumption from the Red Steps. Here, by the Red Doors of the cathedral tsars were showered up by coins after the coronation. Before this ceremony took place in Vladimir. The key building of the architectural ensemble of the square is Ivan the Great Bell-Tower, an architectural art wonder of the XVI century. It was built instead of the Church of St. Ioann Lestvichnik erected during the reign of Ivan the Kalita. The bell-tower height is 81 meters. It became the key observation and fire tower of the Kremlin. 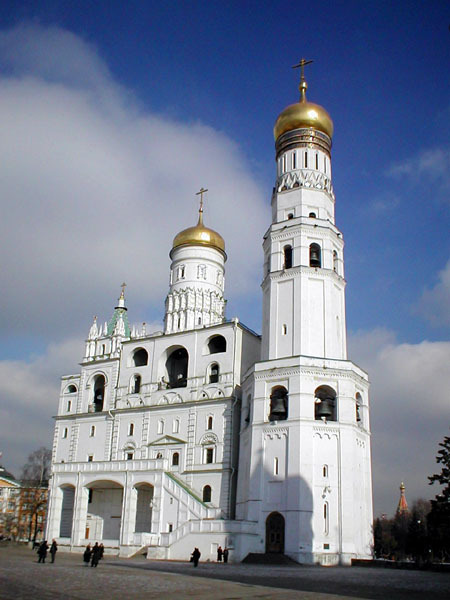 Ivan the Great Bell-Tower was erected in 1505 — 1508 (architect Bon Fryazin). Originally its height was about 60 meters. In 1598 — 1600 tsar Boris Godunov decided to build a new cathedral that was to predominate all the Kremlin churches and cathedrals and become the height dominant of the Kremlin ensemble. As a result Ivan the Great Bell-Tower was raised. Besides the bell-tower itself the ensemble includes a bell loft built in the 30s of the XVI century and the Philaret’s accommodation with a tent roof erected in 1624. One more remarkable monument of the Sobornaya Square is the Church of Lord’s Robe Deposition. It was founded by Metropolitan Iona in 1451 to commemorate the release from the Tartar Yoke. It turned out that the enemy troops retreated from Moscow on the holiday of the Deposition of the Robe in the Church of St. Mary of Blachernae. This small church near the walls of the Cathedral of the Assumption was built in the territory of the metropolitan yard. Architects from Pskov built it in 1484 — 1485 instead of the home metropolitan church that burnt down earlier. Despite the moderate volume the church is notable for its unusual decoration techniques and forms. All the murals of the cathedral were performed by tsar icon painters Sidor Osipov, Ivan Borisov and Semyon Abramov in 1644. The specific feature of the murals of the Church of the Deposition of the Robe composition is the absence of the Last Assize scene on the western wall. The Church of Lord’s Robe Deposition. The Patriarch’s Chambers were built in the middle of the XVII century for Patriarch Nicon. 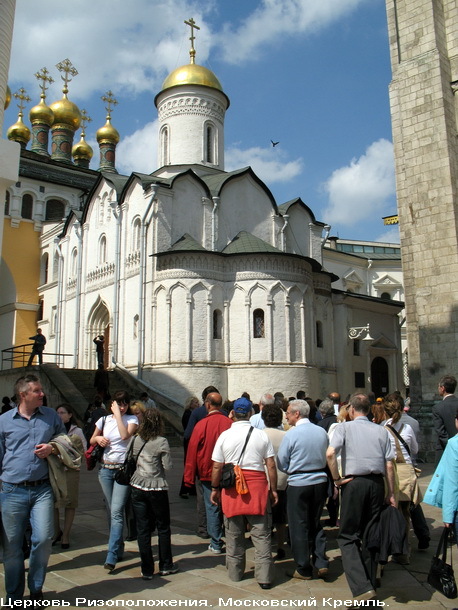 To enter the Patriarch Chambers from the Sobornaya Square people came through the two trussed arches located under the Church of the Twelve Apostles. In 1793 architect M.F. Kazakov relaid the vault, changed the windows form and made new portals. In the showcases of the Krestovaya Chamber there are exhibited various articles of daily use that allow to imagine a range of types, genres and techniques of arts and crafts of Russia and other countries. There are articles made of copper dated back to the XVII century, dish ware made of precious metals for state occasions, Gospel settings, unique in their implementation and bravery, gifts made by ambassadors to the tsar and many more. In the Frater at the home Church of the Twelve Apostles samples of the Russian art embroidery of the XVII century are presented. The Cathedral of the Twelve Apostles was erected instead of the Church of Solovetsky Wonderworkers and a part of the Boris Godunov yard and was called the Church of St. Apostle Philip. In 1680 the cathedral was reconstructed and given the contemporary name. The Church of the Twelve Apostles. In the middle of the XVII century there were over 20 streets and 10 squares in the Kremlin. The Sobornaya Square was the key one. Sometimes it was called Tsarskaya, sometimes — the Red one. Decorous processions accompanied by gorgeous military escorts, official ceremonies on religious holidays, parades and feasts for the people took place there. The most ancient square of the capital was a witness of all the epochal pages of the Russian history. At present all the most ancient cathedrals of the Kremlin situated on the Sobornaya Square serve as museums where ancient Russian art masterpieces are exhibited though they also perform their religious functions.